Where’s the next property bubble building? Property prices in developed markets have rebounded from the crash which followed the credit crisis of 2008 – but there are now increasing fears of a new bubble inflating in several locations. Israel, Canada, Norway, Belgium, Australia, Dubai, Hong Kong, London and Singapore are all causing concern among economists and property market analysts. House prices have risen by close to 40 percent in Israel since 2009, with Norway up by nearly 30 percent and Switzerland by over 20 percent over the same period. These house price booms are being fueled by the relative ease with which residents can borrow more money to fund house-buying. After central banks including the Federal Reserve and the European Central Bank (ECB) propped up the financial markets with an influx of cheap money, these banks had more credit available for consumers. And those loans are cheaper as a result of historically low interest rates in many countries. "When interest rates are so low, there's always a risk of too much money being allocated to assets you can borrow against," Liam Bailey, partner at global estate agents Knight Frank, told CNBC. While most of the house price booms are likely to continue through 2014, 2015 could see a number of bubbles bursting, according to economists at Goldman Sachs. This has led to governments in a number of places taking action to cool the housing market. In Hong Kong, prices last year came to 13 times the average salary, making it the world's most unaffordable city according to Demographia. The Chinese government has since tried to cool the market by doubling stamp duty on properties sold at more than 2 million Hong Kong dollars ($200,000). "Politicians want a recovery in the housing market but are wary of the danger of significant exuberance," Bailey said. The Singaporean government has tried to gently ease down prices by capping what multiple of their income prospective buyers could borrow. As this graph from Goldman Sachs demonstrates, the faster real house price appreciation (the rise in house price valuations) has been, the more likely they are to see a slump in the next five years. 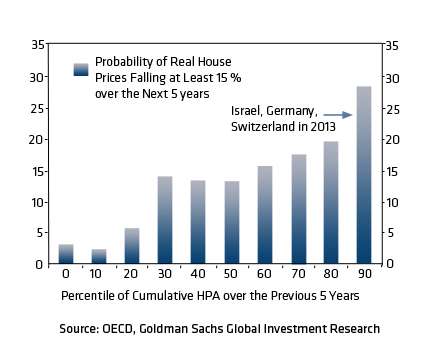 Based on this methodology, Israel, Germany, and Switzerland are most likely to see a significant drop in prices, according to Goldman Sachs economists. But if the ratio of house prices to rent (which can mean that people put off buying homes if it is too high) is taken into account, Belgium, Finland, Norway, and Canada look most in danger. To work out where bubbles may burst when the inevitable rise in the cost of borrowing comes, it is worth examining each country's supply and demand. Peaks in housebuilding are usually followed by peaks in property prices within a couple of years, according to Goldman Sachs. Israel's house price boom has been prompted by increased international investment, but also the historical lack of supply. With construction in the state always a political hot potato owing to disputes with Palestine, the supply issue is unlikely to be resolved soon. In Canada, on the other hand, the number of permits issued to build houses is at an all-time high, and the level of construction activity is causing concerns about overbuilding. The market has been driven in Vancouver in particular by lots of Asian demand, according to Bailey. "It's stronger than it was but doesn't quite seem like a bubble yet," Bailey told CNBC. Sydney and Melbourne's markets are also benefiting from an influx of international cash, mainly from China, Malaysia and Singapore, according to Bailey. In London, while the central London market has been driven in part by foreign buyers, outside of the center of the capital, the story is very different – and prices are distinctly less quick to rise. "London is more of a domestic story than you'd think," Bailey said. The long-term constraints on supply in the U.K. will also keep London prices from a sharp fall, Goldman Sachs economists believe. Even some of the most notoriously burst bubbles of the 2008 crisis are re-inflating quickly. Like London, Dubai has benefited from its safe haven status, with an influx of money from the Gulf post-Arab Spring, and Indian investors, helping to buoy prices in the city state. "By the time the Fed finally ditches Zirp and hikes rates, the Dubai property market will have more than recovered the losses from its property bubble bursting," according to Kit Juckes, head of foreign exchange research at Societe Generale. "Healthy isn't the word that springs to mind but for a while Ben's monetary madness is the ultimate palliative."